Parent Testimonials - Amazing Swimmers, Creating Confident Swimmers! Amazing Swimmers, Creating Confident Swimmers! I am a mother of a 3 1/2 year old that starting taking Infant Swim Resource (ISR - www.infantswim.com) lessons when she was only 9 months old. Our intent was to make sure she would survive in the water should she ever accidently fall into our pool. 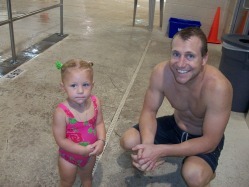 Long story short, my daughter swam before she walked!! Now, she absolutely LOVES the water and during the summer it is hard to keep her out of the pool. A couple months ago, it was a beautiful chilly day here in South Florida and she and her father were playing with bubbles on our patio/pool deck. My daughter went to chase a bubble and accidently fell into the pool... clothes and all. After coming up from underwater a little shocked, she quickly swam to the edge of the pool and her father was able to pick her up out of the water. For a couple seconds she was still a little shocked and then smiled and laughed it off. I am so thankful for what she learned from our ISR experience and plan on enrolling our now 4 month old daughter in ISR lessons as soon as it gets a little warmer. I am a true believer this swim lesson technique saves lives! A very thankful parent... Dana S.
Hey Natalie!!!! I forgot to tell you about a really great SUCCESS story we had with Madison last week.....We were in the hot tub and Maddie started to walk along the side of the pool (which she ALWAYS does). However, this time it had just rained so our stone was ...slippery and she slide right in to the deep end!!!!!! Obviously it startled her and I immediately heard her scream out, but before I could get to her, she had already found the edge of the pool and was holding on until I picked her up! Keep in mind, she went in facing towards the pool so in that short period of time, not only did she find the wall, she had to turn her body completely around to get to it!!!! The funniest part is that she wasn't so much afraid as she was "aggrivated" that the water was COLD..... How's that for a happy ending? Not too bad for a 19 month old. She must have a really great instructor!